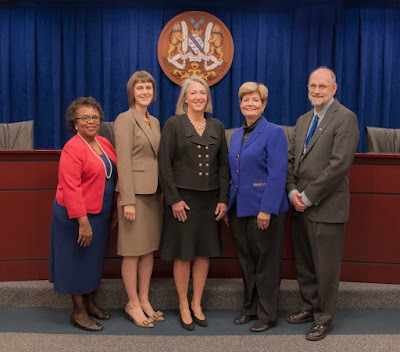 The final Mayor & Council meeting of the summer in Rockville last night had a full agenda, with several long-term projects gaining approval. More than eight years after beginning the process, the Rockville Pike Plan received unanimous approval from the body. Mayor Bridget Donnell Newton reminded everyone that part of the delay was caused by the city's consultant, who drew up a plan that was not viable for Rockville. Successive mayors and councilmembers, and planning commissioners, were tasked with reshaping a European vision into something more suited to Rockville. Depending on your perspective, the revised Pike Plan is either more flexible, or more favorable to developers, than the one sent to the Mayor and Council by the Planning Commission. Most prominently, building height restrictions will be much more liberal than the Planning Commission's height caps. In other development news, the Mayor & Council unanimously approved EYA's Tower Oaks development, which will include 375 housing units along Preserve Parkway. Last minute edits to the plan included a notation that affordable units be spread out through the development rather than clustered in one spot. Newton suggested "scattered;" EYA SVP Aakash Thakkar said his firm uses the term "integrated" to mean the same thing. The latter language was deemed acceptable. Councilmember Beryl Feinberg wanted some assurance that a shuttle would begin service for residents before 100% of the units were sold. Thakkar said 50% occupancy would create the "critical mass" needed to support the shuttle in terms of ridership. The Mayor and Council also accepted that provision. Planning and Zoning Director Susan Swift suggested the Mayor & Council tie the shuttle to the issuance of occupancy permits for 50% of the single-family homes, townhomes and mulitfamily buildings. That would give City staff a way to verify the threshold had been met, she said. Finally, the Mayor & Council voted 3-2 to approve a study of a Circulator bus or trolley within the City. City staff would develop a scope of work for the project in September. A consultant would be hired by early 2017, and a report would be due by Fall 2017. Councilmembers Julie Palakovich Carr and Mark Pierzchala opposed the study. "I'm not enthusiastic about this," Pierzchala said. "As far as a Circulator type solutions, we have all the information we need right now. It's expensive." Pierzchala said he also feared that a City Circulator would prompt Montgomery County to withdraw its investment in existing bus service, leaving Rockville taxpayers holding the bag. "I am really afraid...the County would have a justification to eliminate Route 45. Suddenly, we're in the transportation business." After extensively considering various Circulator scenarios, Pierzchala said, "I can't make it work." Palakovich Carr concurred. "I'm not sure what else there is to learn at this point," she said. "I just don't think we need to spend $60,000 or more." She suggested Rockville put its efforts toward County proposals like Bus Rapid Transit, and more direct door-to-door options for those in need. Newton declared herself "disappointed" with the dissenters, arguing that the Circulator would address many of their stated political goals on the environment, among other issues. Feinberg proposed exploring having the study done by University of Maryland graduate students to save on costs. While not ruling it out, Newton said it was important that the City use professional and experienced consultants. "This needs to be...done with the best experience and knowledge," she said. Why waste money on a shuttle study, just throw it in the parking garage and making parking free.